On September 10 Virginia Governor Terry McAuliffe (D) attended the #WhateverItTakes gun control rally with an armed guard by his side. McAuliffe was at the rally to push for more background checks in the wake of the murder of Virginia reporter Alison Parker, who was killed by a gunman who passed a background check for his weapon. 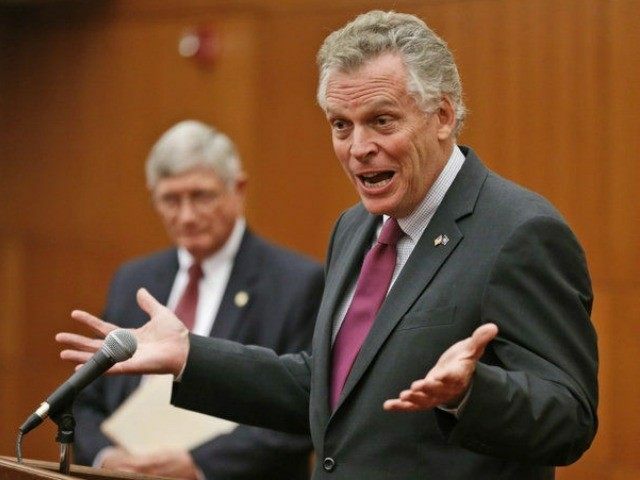 According to Townhall, when McAuliffe showed up at the rally he “brought his armed body guard with him.” He tried to diminish the irony of bringing an armed guard to a rally focused on limiting access to guns by suggesting anyone at the rally could have lawfully carried a gun if they passed a background check. This is a theoretical answer that ignores the demonstrable fact that the DC City Council has all but crushed the possibility of law-abiding citizens carrying guns for self-defense in the district. Moreover, the council’s path to doing this included some of the very kinds of laws and ordinances that gun controllers like McAuliffe pushed in their own states. Townhall also pointed out that McAuliffe is not the only gun control advocate who wants to retain the use of guns for his benefit while making them more difficult for law-abiding citizens to acquire for themselves.